Really, what makes metal metal is a value more intangible than we believed possible; a certain indominable spirit, if you will, that transcends mere musical or ideological borders, striking at something deeper within the human mind that makes one want to headbang and change the world. musical structure, melodic variety, ideology, aggression, etc. However, it seems all of these various factors are being overturned one by one ! Technical Melodic Death Metal Keren asal Pontevedra, Galicia, Spanyol yang eksis sejak 2001 ini lebih gw kenal sebagai band Technical Death Metal dengan nama ABSORBED, dan nama " Unreal Overflows " diambil dari Demo ke 2 nya tahun 1992, setelah band tersebut membubarkan diri, akhirnya beberapa membernya membentuk Unreal Overflows masih dengan konsep yang mirip pula dengan lebih banyak menambahkan elemen melodius pada beberapa part-nya yang Progressive punya, Perhaps dubbing them 'extreme progressive metal' would be a more appropriate descriptor, as this band lacks many of the elements that one would believe to be essential to death metal. Apart from the occasional flicker of Gothenburg-inspired melody (tastefully done, if I might add), there isn't much to link the band to its parent genre. While I won't go so far as to say that Unreal Overflows are creating a new genre with their debut, I will say that their music is definitely unique, albeit in a somewhat subtle form. untuk yang rada penasaran kayak gimana konsepnya itu, mungkin bisa gw gambarkan sedikit jika ini adalah penggabungan Materi Death era " Symbolic " dan " Sound ... " yang kemudian dipadukan dengan gaya Cynic lama serta Gojira. dan tentunya gw masih mengingat dan menikmati album sebelumnya " Architecture of Incomprehension " tahun 2006, band ini memang menawarkan dinamisme Musik Death Metal yang Cool dan Indah untuk dinikmati setiap komposisinya. digarap di studio pribadi milik Frontman Gitaris Vokalis Zoilo Santiago Loira, Unreal Studios, inilah debut Matang yang siap menjadi masterpiece Karir band ditahun 2012. tentunya gw salah satu penikmat " Kualitas " musik, jadi tinggal memerlukan sedikit waktu aja untuk memahami karakter musikalitas band ini, hmmm excellent Nice for good job !! Unreal Overflows, despite having intensity in the music they choose to play, possessing all the unclean vocals, double bass drumming, and heavy riffs of their contemporaries, they seem uniquely unaggressive. Even during their heaviest, most intense movements, the band seems to be expressing introspection over anger. Most of the sounds on this release are actually highly inquisitive and thoughtful in nature. The addition of subtle, jazz-influenced piano on pieces heightens such emotions even further. Yuk Kita tengok track awal " Rotten Mentality ", kita udah langsung disuguhi permainan Technical dan Progressive dengan Lick serta skill yang menarik, setiap Jemari Riff yang bermain, Proggresi Drumming-nya menjadi karakter selaras untuk menciptakan komposisi musik yang kompleks dan itupun harus diimbangi dengan sinkronisasi nada dan pattern yang Match ! aroma materi Terakhir Death, Gojira dan Cynic Lama memang sangat terasa menjadi salah satu pengaruh berat band ini. Certainly, Unreal Overflows a degree of that band's technicality as well as some element of their melodic stylings on guitar However, the most obvious resemblance is not musical, but spiritual in nature. sentuhan Skill Musisinya memang diatas rata2 untuk mengaransemen Lagu yang baik dengan beberapa sentuhan Melodius Riffing ciamik. Permainan Drummer Jorge Rosales Portela memang mumpuni banget dengan karakteristik Acid Jazzy-nya, sehingga mampu bereksplorasi dengan kecerdasan Riffing-nya. Gaya Vokal Harsh lebih klop untuk menghiasi konsep band ini, sehingga Vokalis Zoilo bakalan lebih konsentrasi pada elemen Gitar ke-2 nya. " When Time is Up " tetap begitu menggoda dengan komposisi musik Matematikanya, part musik konvensionalnya memang menjadi Tradisi tak terelakkan untuk menciptakan " Art " musiknya. " Last Failure " lebih mencoba menguras Speed dan kepekaan antar member-nya melahirkan gaya dinamis pada setiap beat dan pattern. The majority of riffs on the album possess a general melody with a hint of atonality that occasionally breaks into more traditional, harmonized dual-lead portions. dan " We're Going Towards Nothing " lebih mengingatkan dengan komposisi " Spirit Crusher " nya Death Banget ! memang sekali kalo band ini lebih mendapatkan suntikan pengaruh segar dari Band Mendiangnya, Death ! total nikmati sendiri 9 lagu berdurasi total 36:53 dengan Hasil Produksi Sound yang memadai buat kita nikmati secara detail, bagaimana " The Next DEATH " dari Spanyol ini memamerkan Intensitas skill dasyatnya. So Rekomendasi banget buat elo fans materi terakhir Death, Gojira hingga Old Cynic ! I would say, though, that such an experiment is in this case a success, due to its maintaining a quintessentially 'metal' sound while presenting intriguing ideas and emotions to the listener. it will most certainly occupy a space in one's brain for a good while to come and is an excellent purchase for the open-minded metalhead, though not one for those seeking extremity. Give it a spin; even though you may not like it, it'll make you think a bit. BUY OR SLAUGHT !!! Really, what makes metal metal value is a more intangible than we believed possible; indominable a certain spirit, if you will, that transcends mere musical or ideological borders, striking at something deeper within the human mind that makes one want to headbang and change the world. musical structure, melodic variety, ideology, aggression, etc. However, it seems all of these various factors are being overturned one by one! Technical Melodic Death Metal Keren origin Pontevedra, Galicia, Spain which existed since 2001 is over i know as a Technical Death Metal band absorbed by name, and the name "Unreal Overflows" taken from her 2 Demo to 1992, after the band broke up, finally some of its members forming Unreal Overflows are also similar to the concept with more melodic elements adding on some part of her that Progressive had, Perhaps dubbing them 'extreme progressive metal' would be a more appropriate descriptor, as this band lacks many of the elements that one would believe to be essential to death metal. Apart from the occasional flicker of Gothenburg-inspired melody (tastefully done, if I might add), there is not much to link the band to its parent genre. While I will not go so far as to say that Unreal Overflows are creating a new genre with their debut, I will say that their music is definitely unique, albeit in a somewhat subtle form. for the rada curious like how the concept that, maybe i can describe a bit if this is the incorporation of an era Death Matter "Symbolic" and "Sound ..." which is then combined with the style of the old Cynic and Gojira. and of course I still remember and enjoyed the previous album "Architecture of Incomprehension" In 2006, the band is offering dynamism Death Metal Music Cool and Beautiful to enjoy each composition. worked in a private studio owned by guitarist Frontman Vocalist Zoilo Santiago Loira, Unreal Studios, is ready to debut masterpiece Matang band career in 2012. gw certainly one of the connoisseurs of "Quality" music, so stay take a little time to understand the character wrote the band's musicality, hmmm excellent Nice for good job!! 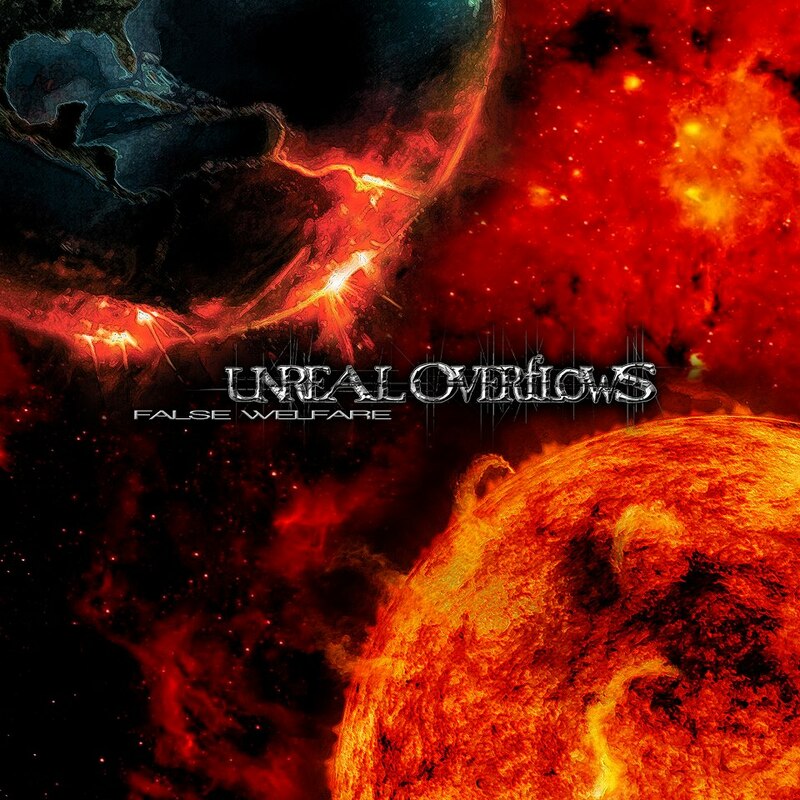 Unreal Overflows, despite having intensity in the music they choose to play, possessing all the unclean vocals, double bass drumming, and heavy riffs of their contemporaries, they seem uniquely unaggressive. Even during their heaviest, most intense movements, the band seems to be expressing anger over introspection. Most of the sounds on this release are actually highly Inquisitive and thoughtful in nature. The addition of subtle, jazz-influenced piano on pieces such heightens emotions even further. Let's look at the track We start "Rotten mentality", we've directly treated Technical and Progressive games with Lick and exciting skill, every riff played fingers, Proggresi Drumming her into a character aligned to create complex musical compositions and even then must be balanced with the synchronization tone and pattern of the Match! material scent Last Death, and Cynic Gojira Lama is deeply felt to be one of the band's heavy influence. Certainly, Unreal Overflows a degree of that band's technicality as well as some element of their melodic stylings on guitar However, the most obvious resemblance is not musical, but spiritual in nature. Skill musicians did touch on rata2 for arranging a good song with some touch of melodic riffing beautiful. Drummer Jorge Rosales Portela game is really qualified to Acid Jazzy its characteristics, so as to explore the intelligence of his riffing. Harsh vocal style more fit to adorn the band's concept, so Vocalist Zoilo going to concentrate more on the second element of his guitar. "When Time is Up" remains so tempting with mathematical musical compositions, part conventional musical tradition has become inevitable to create "art" music. "Last Failure" over trying to drain the Speed ? ?and sensitivity among members of his dynamic style bear on every beat and pattern. The majority of riffs on the album possess a general melody with a hint of atonality that occasionally breaks into more traditional, harmonized dual-lead portions. and "We're Going Towards Nothing" is more reminiscent of the composition "Spirit Crusher" Death Banget her! if the band is once more getting an injection of fresh influences Mendiangnya Band, Death! enjoy yourself total 9 songs total duration of 36:53 with Sound Production adequate for us to enjoy in detail, how "The Next Death" of Spain's showcase dasyatnya skill intensity. So Recommendations fans really make the material last elo Death, Gojira by Old Cynic! I would say, though, that such an experiment is in this case a success, due to its maintaining a quintessentially 'metal' sound while presenting intriguing ideas and emotions to the listener. it will most certainly occupy a space in one's brain for a good while to come and is an excellent purchase for the open-minded metalhead, though not one for those seeking extremity. Give it a spin; even though you may not like it, it'll make you think a bit. BUY OR SLAUGHT!! !